When we decided to go after investment for our company, we came to the point where we needed a business case. Business cases are generally no more than 10-15 pages of slides. We built our business case based on what Angel Investors and VC firms look for when they review a plan. Different firms have different requirements, although many are similar. After speaking with a wide range of investors, below is the summary of what these investors looked for in a business plan. The Value Proposition: The big questions that the value proposition should answer is ‘Why you?’ Why should someone buy your product or service – is it better, faster, is it believable, unique, does it have a competitive advantage, and does it solve a big need or frustration? Industry and Competitive Analysis: Profitability and size of industry (TAM > $1 billion), industry trends and growth prospects (>20% growth preferred). Who are competitors, both direct, indirect, and substitutes. How thoroughly were the competitors researched? Is there a barrier to entry for other competitors? Customers: Are the customers described the right ones? Is the company laser focused on one segment to start? Is there a proof of concept? Have customers evaluated the product? Team and CEO Resume: Within the executive team is there ‘The 4 levels of experience’: entrepreneurial, functional/technical, marketing and sales, and leadership. Is the team fully committed financially and time-wise? Does the leadership have a passion for the company and industry? Marketing and Sales: Are the tactics realistic? Is pricing strategy based on market knowledge? Are the selling process, timing, and churn-rate defined? Operations: Does the company have strategic partners? What is the manufacturing strategy or development plan? Is manufacturing outsourced with quotes established? Financial: Quantitative basis for key assumptions? Are numbers for revenue and growth realistic? Cash flow positive by year 3? Sufficient cushion on cash needs? Does the plan have a realistic pro forma? Risks, milestones, exit strategy: Are the risks and risk-mitigation plans included? Does the company have achievable milestones? Is there hard data to show target customers will buy? Do comparable exit multiples exist and are they included? Based on these factors, an investor will make the decision on whether to take the company to the due diligence step. During due diligence the investor will likely dive in deeper to the details of each area to drive to a final decision. In particular, any missing sections will need to be developed. One additional note to entrepreneurs: according to two Entrepreneurship faculty at UNC Kenan-Flagler Business School, Randy Myers and Ted Zoller, the weakest section in over a third of business plans is the industry and competitive analysis. So make sure to make those sections robust! 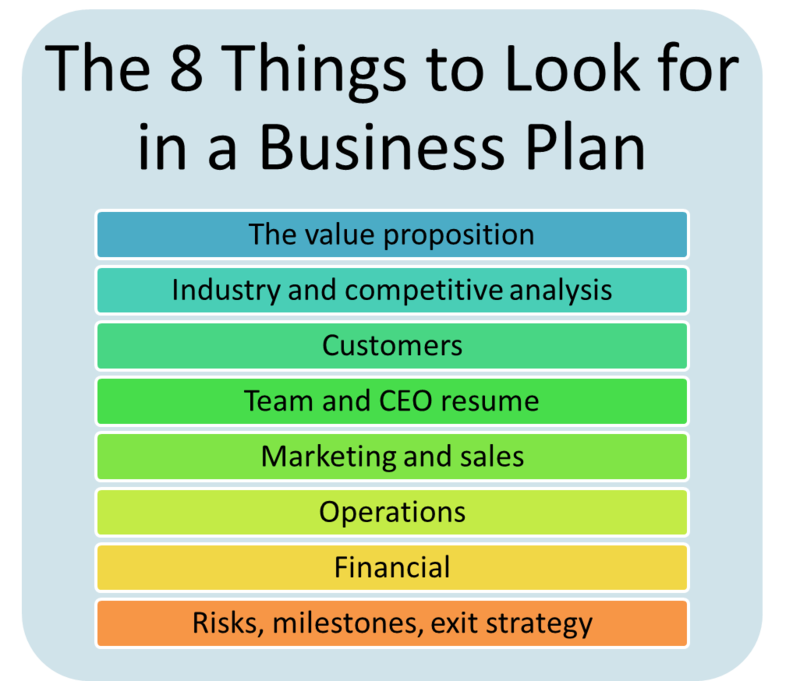 If you are writing a business plan, good luck! And feel free to get in touch for assistance in developing your business plan. This entry was posted in Business plans, Entrepreneurship, Leadership, Marketing and tagged Angel investor, Business, Business plan, Consulting, Investor, Investor business plans, Small Business, VC, VC firm business plan, Writing a business plan. Bookmark the permalink.